Allegations of regulatory violations continue to mount for LPL Financial as FINRA announced today that the firm failed to waive mutual fund sales charges for certain charitable and retirement accounts. LPL Financial, Wells Fargo and Raymond James were ordered to collectively pay more than $30 million in restitution to affected customers who paid sales charges on shares of Class A mutual funds on numerous occasions since June of 2009. This violation is just the tip of the iceberg for LPL Financial, a profitable company that operates in a way that primarily benefits its brokers at the expense of their investors. FINRA offers 5 tips to help investors from being tricked out of their money. With our help, Mr. Leon K., a 57-year-old dairy and crop farmer from Minnesota won his case against Spartan Capital! Mr. K. invested his hard earned money with Spartan Capital where his account was on margin without his knowledge, he was charged excessive commissions totaling over $26,000 and his account was traded with unauthorized and unsuitable transactions.Congratulations Mr. K! Donnie P. won his case against Obsidian Financial Group and his broker! Donnie is a 57-year-old used car dealership owner from Florida who invested his late wife's death benefits with Obsidian Financial Group. Some of the abuses Donnie suffered at the hands of his Broker and Obsidian Financial Group are churning, margin abuse, unauthorized trading and unsuitable investment recommendations.Donnie was awarded $152,298.83 plus interest at a rate of 3% per annum from the date of the award until it is paid in full. Another happy Cold Spring client!! 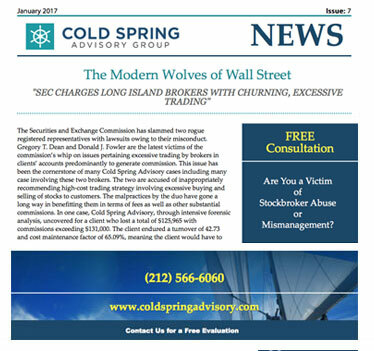 Washington D.C. — The Securities and Exchange Commission announced fraud charges against a former stockbroker Bernard M. Parker. In yet another story of a stock broker embezzling their client’s money, Bernard M. Parker is accused of stealing investor money to remodel his house and pay other bills. He allegedly raised more than $1.2 million from his longstanding brokerage customers who were told they were purchasing legitimate real estate tax lien certificates and would earn returns of six to nine percent annually. Parker however, used the majority of their hard earned money to remodel his home in Indiana, Pa., make car payments, and pay bills for his family.